In this follow-up to Katie John (1960), Katie John Tucker and her parents have fixed up their large Southern house, and they are ready to accept boarders. Katie is enthusiastic about helping to find new tenants, but as the house fills up, she also begins to realize how much work it is going to be to help keep things running smoothly. Not only does she have to help with housework, she also looks after the young son of one of the tenants, and when she receives a puppy for a gift, she has to keep him from disturbing the tenants and surrounding neighbors. In the meantime, Katie is also the new girl in school, and though she is pleased to have Sue as her best friend, she really wants to find a way to win the affection of all of her classmates, which leads her to take on even more work than she can really manage. As a kid, I was fascinated with the idea of a boarding house, so I really enjoyed meeting each of the characters who come to live in Katie John's house throughout the course of this book. They are a colorful bunch of people, including a pair of women who listen to loud country-western music, Katie John's own teacher from school, and Cousin Ben, a distant relative who shows up unannounced at the start of the cold weather and remains in bed, with his bedroom door wide open to the front hallway, all winter long. The quirks of these characters, and Katie's reactions to them as she becomes more and more overwhelmed by their presence, are the real appeal of this book, and they bring the big Southern house very strongly to life. The other thing I really loved about this book is that it shows a 10-year-old girl as a dependable, helpful, and capable contributor to her household. 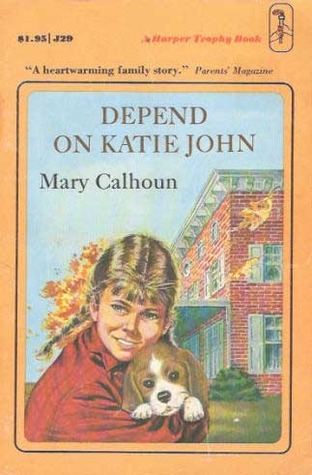 By contemporary standards, Katie John does seem to have a lot of responsibilities, but I liked that her parents allowed her to work out many of her own problems independently, and that she resolves many of the difficulties in the book by her own wits. I also like that she makes her fair share of mistakes, but that these do not serve to undermine her overall positive contributions to the boarding house, and to her classroom as well. I look forward to reading the rest of the Katie John books: Honestly, Katie John! and Katie John and Heathcliff and will gladly save the series for my girls to read in a few years.